The book’s contemporariness is obvious in the context of the resurgence of autonomist politics accompanied by street violence/strike in the Darjeeling hills after a brief lull. For any observer of hill politics, it is obvious that the ground reality in the insurgent region has remained largely the same even after the change in the political regime, local organizational leadership and a new player BJP gaining traction in the region. The autonomist politics in the hills, as the book informs us, has not only been confined to the demand for separate statehood within the union but also to be recognized as a distinct ethnic group entitled for state policies of welfare based on the principle of protective /compensatory discrimination. And this politics has unfolded into phases due to mechanization of the state bent upon creating a wedge within the greater Gorkha conglomerate. they even learn to give up their inherited Hindu /syncretic cultural practices and adhere to Buddhist way of life as being Hindus would come in the way of being classified as tribal by the state and thus would deny them the benefits of state affirmative action system. were never keen to meet the demand of indigenous but settled community of being recognized as a hill tribe with distinct culture/tradition. ethnic based autonomy as envisaged in the tripartite agreement between the governments of India and West Bengal and GNLF remained a mirage. All it achieved was to ensure a fragile peace for the next twenty years. In the first decade of the new millennium, the people’s anxieties to be recognized as true and equal citizens of India endowed with equal rights and not as foreigners and at the same time getting rid of the ‘corrupting’ influence of Hinduism over their identity got a boost with the emergence of the Gorkha Janmukti Morcha (GPLF) led by firebrand Bimal Gurang in 2007. Politics of recognition here also emanated from humiliation felt by Gurang community when a radio DJ mocked the Gorkha community by the Bengali chauvinists expressed in the Indian Idol case and subsequently it led to a clash between the Bengali and the Gorkha community. Then onwards there has been a shift in the focus of local protest. It has since then been mainly the demand for a separate statehood and not autonomy within what the Gorkha minority feel to be Bengali hegemony. Within the Bengali community, there is an element of demographic anxiety which is also played out in the region like elsewhere in India recently as politicization and mobilization of identities continues to get traction from internal cultural politics of the movement that has experienced identi-ficational shifts from Gorkha politics in a quest for recognition as a tribal community and back again to demand for separate statehood. The successive political regimes have stoked the fire using the colonial tricks of creating a wedge within the community by sectarian preferential treatment to certain groups i.e., creation of separate Development and Cultural Boards for the Lepchas and Tamangs, the two tribal communities in the region, ostensibly to wean them away from the GPLF led Gorkhaland Territorial Administration. The book deserves attention for its methodological brilliance. 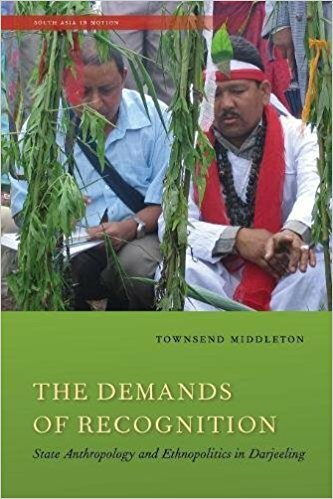 It is a classic text of ethnography as Middleton over a period of a decade (2006 onwards) engages himself most creatively with two distinct communities namely the Gorkha community looking for recognition as a tribal community and subsequently to achieve their ‘own’ State and also the West Bengal government anthropologists who have been entrusted with the task of ascertaining the collective claim of the Gorkha community, going to them again and again winning their confidence despite or may be because of being a complete outsider. Narratives used are short and the focus is more on sketching out the particular event in finer detail which is most helpful though a little unusual for ethnographic literature. Middleton is sympathetic but that in no way checks him from telling us the inherent paradox the Gorkha community faces: the need to be accepted as Indian but at the same time becoming/being made increasingly conscious of his/her roots. One hears the voices of ordinary masses belonging to greater Gorkha (‘Nepali’) ethnic community, ethnic elites and the government functionaries but then the voices of the non-Gorkha (read Bengali/Biharis/Marwaris, among others) communities is missing as well as the political class/top bureaucrats sitting in the Writers Building in Kolkata. One would have also wished to see the local intelligentsia’s views on the tragic saga unfolding over two decades without any hope of near solution. Political developments are mentioned like the ethno-politics of Mamata Banerjee led TMC or new entrant BJP and the recent elections in Darjeeling but not much detail is there. May be that is not the focus of a trained ethnographer. Reading this elegantly written book makes us acutely aware of how ethnic differences in India are ‘known, ruled, and lived’ and how an ethnic community like the Gorkhas while asking for its ‘own’ territorial homeland/ autonomy search for rights, autonomy and belonginess. Ashutosh Kumar is Professor in the Department of Political Science, Panjab University, Chandigarh, India.